Leeds’ own Olympic boxing champion Nicola Adams MBE will be the guest of honour at the launch of a new exhibition showcasing local talent this week. The 30-year-old, who made history at London 2012 by becoming the first-ever winner of an Olympic gold medal in women’s boxing, will be star guest at a display of art produced by local girls which goes on show at the St John’s Centre at 4:30pm tomorrow (14 March). The display is the culmination of a year-long arts and photography project carried out by a group of local Leeds girls aged 11-15 through the Harehills-based charity Getaway Girls to use the Olympic themes to look at the roles of sportswomen from the past and present to the future as well as fashion within the sports industry. Nicola, who was recently presented with her MBE for services to boxing at Buckingham Palace, is the president of national Sport England-funded initiative US Girls which aims to encourage young women in disadvantaged areas to be more active, and was a partner in the project. All media are invited to the launch of the exhibition at the St John’s Centre off The Headrow in Leeds at 4:30pm on Thursday 14 March. Olympic champion Nicola Adams MBE will be available for media interviews along with some of the girls involved in the project. The project was also supported by funding from Leeds City Council’s Leeds Inspired programme and its museums and galleries service. A strong emphasis of the project was on art and photography, with the girls taking part attending various sporting events to take photos and also interview the women and girls competing. They also organised a photoshoot with City of Leeds diver Jenny Cowen where they were responsible for organising the shoot, lighting and make-up. The girls then created their own graffiti art on the themes they had discussed and also worked with a local poet to create poetry around sport. Throughout the year the girls also played a variety of sports in their local park with the underlying aim of the project being to allow them to understand that anyone can take part in sport, regardless of ability, and how women in sport can overcome any barriers they may face. The exhibition, which will be on display at the St John’s Centre for two weeks before moving to Leeds City Museum, is the culmination of the group’s work and their views on sport and women’s role in sport. 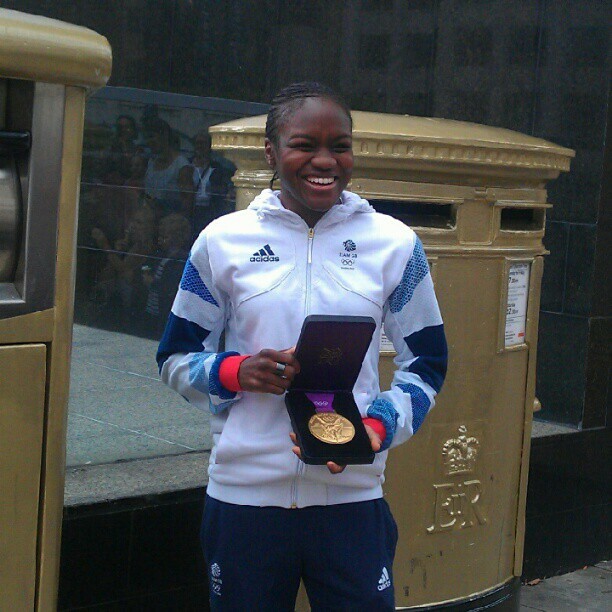 Nicola Adams will meet the group and discuss the project with them before officially opening the exhibition. “We are thrilled that Nicola Adams is able to meet the girls and see the work they have produced for this new exhibition. “Nicola emerged as one of the real stars of London 2012, with her story of talent, hard work and incredible dedication to being the best she can be proving an inspiration to people of all ages not only in the UK but worldwide. Us Girls aims to get 30,000 young women living in disadvantaged areas more active, by providing them with opportunities to play sport within their local communities. Us Girls is being delivered by the Active Women Consortium, a body led by StreetGames.